Rarely has any river gathered in itself so much meaning and reverence as the Ganga has over three millennia in the Indian subcontinent. The land-water interface on the Ganga’s banks is fashioned out of the need to access the rising and falling water levels in the monsoon and dry seasons. The cultural landscape of this interface—ghats (steps and landings) lined by temples and other public buildings, pavilions, kunds (tanks), streets and plazas—is layered and kinetic, and responsive to the river’s flow. 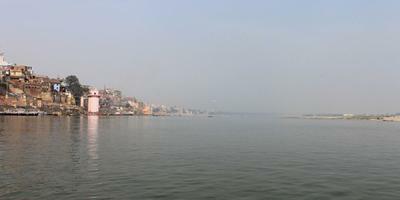 At Varanasi, where the Ganga reverses its flow northwards, the ghats describe a crescent sweep in a 6.8 km stretch. They date back to 14th century although they were extensively renovated and extended in the last three centuries to allow access to the holy Ganga from the temples and shrines of this ancient city. The narrow streets of old Varanasi end at the wide landings of the ghats, leading the residents, pilgrims, and tourists to the river where they worship, bathe and cremate the dead. The ghats are public commons, ritual spaces, and cremation sites. As such they represent an extraordinary cultural heritage in their history and as settings for continuing enactment of ancient traditions that sustain cultural memories, beliefs and values. The cultural landscape of the ghats evolved in a spatio-temporal order created from self-organized systems of worship and pilgrimage. Its structure, complex in its layering and detail and in responding to natural processes was resilient in its recovery from natural disasters as well as cultural upheavals. However as the landscape becomes increasingly stressed from intensive use and ground and water pollution, its irreplaceable heritage is being lost. The dilapidation of the urban edge due to ill-maintenance, private encroachment, pollution in the Ganga, and increasing pressures of use caused by three million visitors every year is stretching its carrying capacity and putting heritage at risk. The shift of the river and silting of banks has impacted the riverfront landscape causing alarm among conservationists who have been pressing since 2001 to have the riverfront and the old city nominated in the UNESCO World Heritage List. 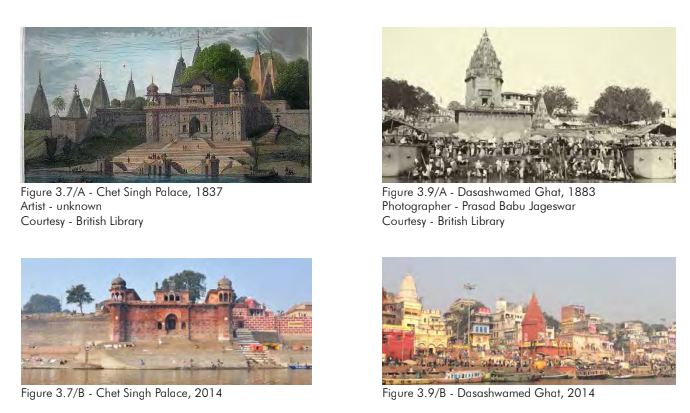 Varanasi ghats fit the categories of ‘an organically evolved landscape’ as well as ‘an associative cultural landscape’ in the cultural landscape criteria. The ghats on the Ganga have evolved over centuries into the spiritual center of Hinduism. Urban infrastructure (sanitation, solid waste management, and water supply) has been upgraded under the Jawaharlal Nehru National Urban Renewal Mission (JNNURM) and measures have been taken to reduce the river pollution under the Ganga Action Plan launched by the Government of India. 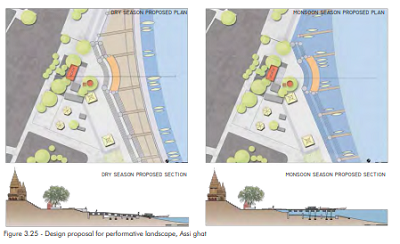 However the schemes already in place need to be coordinated and on-going efforts integrated into a landscape conservation plan for reclaiming and restoring the ghats. This is a common and crucial aspect of the many programs and contributes to the broader goals of cleansing the Ganga of local pollutants through urban interventions. 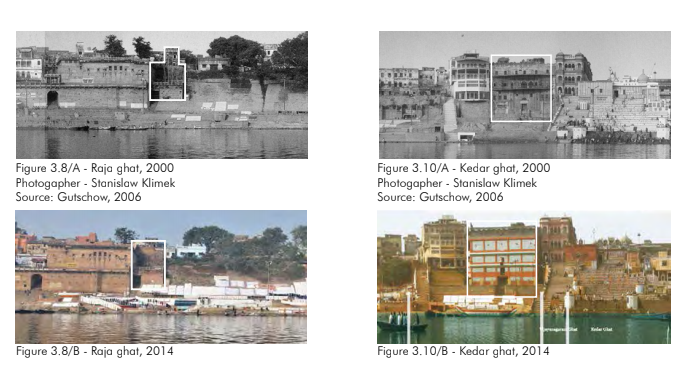 Individual categories for heritage assessment—built, intangible, natural and cultural—are problematic when applied to Varanasi ghats as they isolate and fragment a unitary phenomena and fail to address the complex and dynamic aspect of change. A more valid form of heritage assessment would be to study the cultural landscape that integrates natural and cultural heritage and sustains intangible heritage. The transcendental view of nature in Hinduism underlies the elaborate structure of myths relating to Ganga, the archetypal divine river and Kashi, the supreme tirtha. The corpus of beliefs about cosmogony, cycle of life and death, purity and pollution, sacred and profane, are tied to reverence for nature and enacted in numerous life cycle and death rituals. The ghat landscape has evolved to support the ritual enactments and is mnemonic of mythic narratives in its built form. Thus the tangible and intangible forms of heritage are inextricably bound. Degradation of the ghat landscape, i.e. deterioration of material/ tangible heritage implies loss of cultural memory. 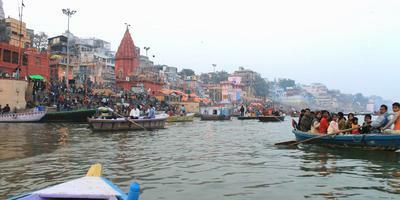 Both natural and cultural heritage are at stake as the pollution in Ganga increases. The ghats are a thin sliver of public space between the dense city and the Ganga. There are 84 ghats on the urban edge. Their number has increased over time as ghats were subdivided into smaller sections and the natural embakment was stepped and faced in stone. The ghats were experienced firsthand and visually documented in site visits by the teams. 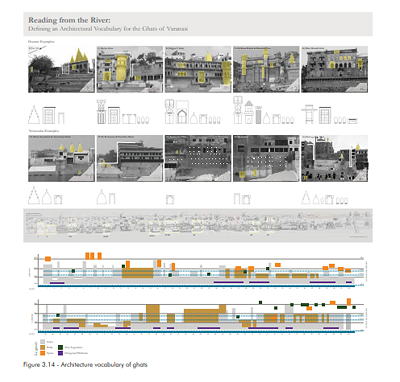 The landscape features and qualities were interpreted through site readings and mappings. The ghat landscape consisting of 300 meters wide swath of the land-water interface, was mapped using Google Earth, Varanasi city map, Wikimapia, and photographs. This is recommended as the protected heritage zone. The heritage zone should be developed and managed within an eco-cultural frame work that addresses environmental pollution and urban degradation. Conservation becomes a tool for reclaiming public spaces and improving the quality of public life. The overarching goal of the project is to preserve cultural values by conserving the urban fabric that is a catalyst as well as a setting for their enactments. Intangible and tangible cultural heritage encompassed by the cultural landscape of the ghats is interpreted in its mythic, enacted, and historic dimensions. The three facets are mutually constitutive—the landscape is read as a tapestry of mythic narratives and is at the same time a setting for their continuing enactments by the devotees thus keeping ancient traditions alive and vigorous. The land-water interface has been culturally significant for over two millennia. While the chronology of its evolution into the contemporary landscape has many gaps, the documented history of the last three centuries holds a clue to understanding the ways in which its built environment was shaped in response to cultural beliefs. The idea of the body and landscape underlies the mythic, enacted, and historic dimensions. The landscape is a symbol of the primeval being purusha and the great gods of Hinduism--Shiva and Vishnu. The icons and deities in the many temples and shrines on the ghats attest to their living presence on earth. Their actions in mythic time are celebrated through ritual enactments in festivals creating the spatial-temporal order in the landscape. The landscape is always in flux, its temporality a function of the Ganga’s seasonal flow and calendar of rituals and festivals determined by planetary motion. The ghats on the west bank of the Ganga are the altar to worship of the sun rising in the east every morning bringing light and life, an end to actual and metaphoric darkness. The phenomenal form of the Goddess Ganga is worshipped through an immersive engagement with the river. The body in action enacts the image of the archetypal body in the narrative landscape. The body of the pilgrim and the tourist is fully immersed in the cultural landscape of the ghats. Being there is a rich, stimulating experience, a total engagement of the proximate senses. In ritual bathing, chanting, and offerings, the acoustic, olfactory, and tactile sensations induce an awareness of the transcendent holy in the here and now. The sense of enclosure, darkness, and heaviness in the narrow lanes of the old city contrasts with openness and expansiveness of the ghats. Panoramic views of the eighty four ghats as seen from the river and the east bank contrast with focused vistas on the west bank. View sheds show the skyline of temple spires, rhythm of steps, openings, and riverside platforms, making apparent the implicit visual order. Site readings in collages represent the mythic and enacted landscapes. In myths relating to cosmic creation and dissolution, actions of gods and goddesses, descent of the river, the body is central to the visual imagery. The phenomenological experience of the body in the landscape is explored through mapping vision; kinesthetic experience of movement and haptic experience of spatial volume; and acoustic, tactile, olfactory experiences. The historic landscape is documented in mapping the street network, buildings, temples, and their design vocabularies. Myths explain the sacred geography of Varanasi and the embodied practices that give it meaning and value in ways history cannot. Myths occur in absolute space and eternal time. Their enactments impart a powerful and timeless quality to the landscape. Varanasi traces its origin to Anandvana, the forest of bliss where Lord Shiva sits in a yogic posture with his eyes closed listening intently to his wife Parvati playing the veena. He creates the cosmos contained in Kashi with his yogic power and her music. He strikes his trident to hold the city and place it beyond the ravages of time. He catches the sacred Ganga in his locks as she pours down from heaven as a result of sage Bhagirath’s penance to revive the sixty thousand sons of King Sagara. She purifies and sanctifies, washing away physical dirt and moral sins. In her phenomenal form, the Ganga invites rich visual, tactile, and haptic experiences in everyday, humdrum activities and performances that carry profound meanings. The tradition of ritual bathing at festivals, in the course of pilgrimage and in life cycle events, has continued through the centuries and carries great significance. Immersion by as many as 70 million people in the Ganga on auspicious days is a grand spectacle, resulting from self-organized activities on a very large scale. The river and its banks are settings of performative rituals, spontaneous and choreographed. They are mimetic of archetypal acts, enacting mythic and ancestral memories, and contribute to a living heritage. Shiva and Parvati came down from the Himalayas and made Varanasi their home. Shiva presides over the mahashamshan, the great cremation ground on the banks of the Ganga, where he whispers the tarak mantra into the ears of the dying bringing them moksha. In temples Shiva is worshipped in the form of a linga, the most famous one in Varanasi and its center, being jyotirlinga in Vishwanath temple, the cosmic pillar of light that connects the city with heavenly and netherworlds. There are hundreds of lingas in the city, however Omkareshvara, Vishveshvara, and Kedareshvara lingas in temples on the three hills supported by Shiva’s trident are greatly revered. The west bank is visualized as the spine of the primordial purusha. The Ganga is conceived as the kundalini power rising through the lotus chakras in his spine and Assi and Varana Rivers are nadi channels intermingling with liquid shakti of Ganga. The highest of the six chakras where enlightenment occurs is equated with Varanasi. Although Shiva is the reigning deity of the city, Vishnu and Brahma have a presence too. At the beginning of time, Brahma’s austerities resulted in a brilliant shaft of light erupting from the earth and piercing the skies and the numinous sound OM signaling the creation of the world. Dashashwamedh Ghat is named after the sacrifice of ten horses performed by Brahma in mythic time and by the Bhara Shiva Naga kings in second century CE. The strife between Shiva and Brahma resulted in Bhairava (manifestation of Shiva) cutting of Brahma’s fifth head. However the skull adhered to Bhairava’s hand until he came to Varanasi and bathed at Kapalmochan kund to atone his sin. Both, Brahma and Vishnu acknowledge Shiva’s supremacy when they could not fathom the beginning and end of his fiery linga. Brahma flew top to the heavens on his goose and Vishnu dived into the waters of the underworld as a boar, but to no avail. Vishnu dug a lotus pond and performed austerities there for thousands of years. Shiva and Parvati appeared and gave him a boon for living forever in Kashi. When they were bathing, Shiva’s crest jewel (mani) and Parvati’s earring (karnika) fell in the pond giving it the name Manikarnika. Close by is the ghat where the dying come to be cremated on the banks of the Ganga and have their ashes immersed in the river that flows through the three worlds. The Ganga is the mother and also a young maiden, consort of Shiva, and the crocodile is her vehicle. Ganga and Shiva, as Shiva Shakti represent the masculine and feminine archetypes. In Varanasi the threads of the myths are woven into a complex tapestry. Myth and reality blur into each other and the modern world is yet another possibility out of many simultaneous multiple existences. The meaning of Kashi as a sacred landscape rests on its image in Puranic texts as a mandala, a cosmogram or symbol of universe, charged with positive energies. Its landscape and built environment have evolved as a medium for visualization of the divine. Kashi mandala is equated with the luminosity of Shiva’s fiery linga. On the banks of the holy river Ganga, it is the domicile of Lord Shiva who is known as Avimukteshvar, one who never forsakes the city. This is the center where all journeys begin and end. It is the point of origin and of continual renewal though the body’s engagement with the landscape in the circumambulatory journeys known as yatras. In obtaining darshan in shrines and temples, bathing in the kunds, walking, performing rituals, chanting, among other activities, the sense of auspicious is enhanced. The holiness of the landscape lies in presenting wholeness through representation of the cosmos. Five circumambulatory circuits—Kashi, Varanasi, Avimukta, Antargriha, and Vishvanath— are traced in pilgrim yatras. They all begin and end with a bath at Manikarnika Ghat. Kashi mandala articulated in panchkroshi yatra is the largest, going beyond the city limits, while the Antargrihayatra is circumambulating only around the Vishvanath Temple complex. While the Kashi and Varanasi Yatras are loops, Avimukta circuit is a spiral reaching the center, Vishvanath Temple. The three-dimensional built version of Panchkroshi Yatra is the Panchkroshi Mandir built in the 1870s. In circumambulating the temple, the devotee sees numerous shrines and deities in niches in the outer wall including 104 visited during the yatra. Varanasi’s auspiciousness is multiplied with the residence of other tirthas of the Indian subcontinent in its territory. Char Dham, four corners of India, Jyotirlingas, the twelve lingas of light distributed throughout India, and Saptapuri, seven sacred cities, are all represented in Varanasi. The spatial transposition of sites in India’s sacred geography to Varanasi creates a complex and metonymic cultural landscape where the whole is signified in its constituent parts. Pilgrim journeys to these destinations, many of them beginning at the ghats, are through a confusing maze of narrow streets that are mapped out for ease of travel. Festivals are celebrated throughout the year on the ghats of Varanasi. They are tied to the seasons, to key moments in the solar and lunar calendar celebrating the passage of sun and the waxing and waning moon, and to the harvest cycle. The myths of Hinduism are enacted in the here and now, rejoicing in the births, marriages, and victories of gods and goddesses over demons. Cosmic time of the four yugas (epochs when the universe is destroyed and created anew) in an endless cycle is related to seasonal time in the circle, symbol of eternal time and absolute space. Myths are thus kept alive in the collective memory through traditions that are re-invented in keeping with the changing socio-economic times. The festive atmosphere is an uplifting experience for participants and spectators alike. The land water interface is celebrated in a spectacular way during the festival of Ganga Mahotsav, revering the goddess Ganga in the Hindu month of Kartik (October-November) when the stretch from Panchganga to Rajghat is lit up with earthen oil lamps. In the recently revived festival of Budhava Mangal, a week after the Holi festival in Phagun (March) musicians perform on the river in decorated barges, and the ghats become a vast amphitheater. On Mahashivaratri celebrating the marriage of Shiva and Parvati, every temple with a linga is decorated for worship and the streets are filled with marriage processions. The famous Ramalila of Banaras enacts the epic myth of the hero god Ram, his birth, marriage, exile and victory over the demon Ravan in Ashvin (October) at various sites on the Ganga riverbank. Dusshera and Diwali mark the end of Ramlila coinciding with Navratri, the nine-day festival celebrating the goddess Durga’s slaying of the demon Mahishasur. Makar Sankranti, Holi, and Vasant Panchami are festivals dedicated to the changing season and to the harvest. The festivals of Janmashtmi, Hanuman Jayanti, and Ganesh Chautha celebrate the births of gods Krishna, Hanuman, and Ganesh respectively at various temples dedicated to the deities. Nagpanchami, festival of serpent worship and Lolarka Chath when Lolarka, the ‘trembling sun’ is worshipped, occur at ancient sacred water bodies, Nag Kuan and Lolarka Kund, close to the ghats. 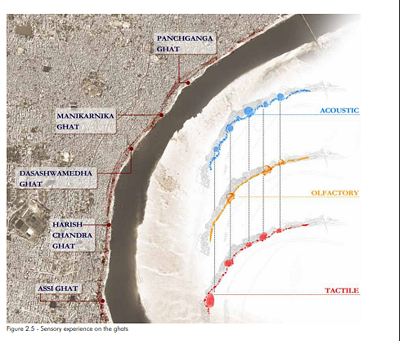 The sensual experiences on Assi Ghat, Harish Chandra Ghat, Dashashwamedha Ghat, Manikarnika Ghat, and Panchganga Ghat are depicted in three layers showing the acoustic, olfactory, and tactile experience. Places with multiple sensual experiences are ‘hotspots’ that give visitors the strongest impressions of acoustic, olfactory, or tactile sensations. The size of hotspots stands for the extent of the stimulation, meaning the larger the hotspot is, the stronger the impression of the activity. Certain activities, such as aarti and cremation, have more than one kind of sensual stimulation and are therefore connected in this three-layer diagram. The collages capture each kind of sensual experience-- aarti and puja are stronger in acoustic stimulation while flowers, burning incense, and smoke have the strongest impression of olfactory sensation. Bathing in the Ganga, eating food, the presence of fire and water, and the breeze felt in flying kites are rich tactile stimulations. 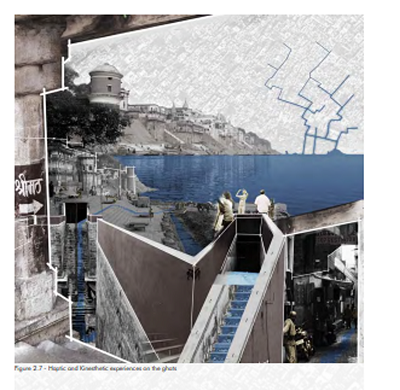 The Kinesthetic experience in moving from the main road to Dashashwamedh Ghat and Panchganga Ghat is depicted in a series of spatial sequences. The haptic experience in the narrow alley is that of darkness and enclosure. Details such as texture of the wall, goods on the stalls, shrines along the road, clothes hanging near windows and many others can be viscerally felt. The movement from the building interior to the ghats entails the transition from feelings of enclosure to expansivenes as the river comes into view. The architectonic structure of the city and its spatial volumes create haptic and kinesthetic experiences. Movement on and along the ghats is through a labyrinth of walls, people, and livestock. Stairs spirals their way down a single cramped shrine located below the streets. Tanks are constructed so they are also below the street. Most alleys appear as a leftover space between the buildings and give a strong sense of enclosure. An automobile cannot enter alleys close to the ghats. If the street is wide enough for motorcycles, livestock, and pedestrians, all three will probably inhabit it. The maze comes to its end at the Ganga River. The vast river starkly contrasts with the cramped streets and crowded ghats. Upon reaching the water’s edge, the sense of relief erases the memory of confusion and claustrophobia that the streets had left. 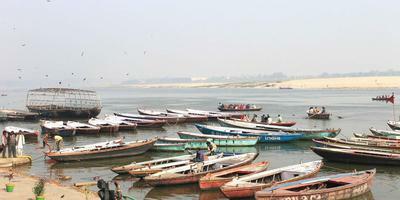 The river is the destination for many Varanasi dwellers in daily life and also in death. The historic character of the ghats is most evident in riverside palaces and temples built in the last three hundred years. Royalty and nobility from different parts of Indian subcontinent built palaces for extended stay by elderly family members who wished to spend their last days in the holy city of Varanasi. The earliest surviving palaces are those built by the rulers of Rajasthan. Man Mandir was built by Raja Man Singh of Amber in 1586 CE and its rooftop houses an astronomical observatory built by another Amber king Sawai Jai Singh in 1710. At Rana Mahal Ghat, is another historic palace built in 1670 by Rana Jagat Singh of Udaipur. Eighteenth century palaces by the Maratha rulers include those built by Peshwa Baji Rao I and Raghoba Balaji in 1735, by Raghuji Bhonsale in 1795, and Indore State Palace by the Holkar queen Ahilyabai in 1778-85. Nineteenth century palaces include those built in 1830 by the Raja Dipatiya of Champaran, by Jiyajirao Sindhia, ruler of Gwalior in 1864, by the Vijayanagar ruler on Kedar Ghat in 1890, and by Rana Shamsherbahadur of Nepal at Gaya Ghat. Ministers of the Maratha kingdoms of Nagpur and Gwalior built palaces on Darbhanga and Jatar Ghats. The local rulers of Banaras also built on the Ganga—Chet Singh built a small fortress in the mid-eighteenth century and Prabhunarayan Singh constructed Ganga Mahal on Assi Ghat in 1830. Palaces continued to be built until the beginning of twentieth century—they include one on Assi Ghat by the queen Radhakunwar of Sursund and by the industrialist Baldev Prasad Birla on Tulsi Ghat. Many of the palaces are no longer in active use and can be adaptively re-used as public facilities. Together with temple spires, they contribute to the iconic view of the Varanasi ghats popular worldwide. The Hindu temples commemorate acts of cosmogony, sacrifices, and austerities of gods and goddesses. Often associated with a holy water body or local divinities, they celebrate the numinous power of the site. Monumental temples were in existence before the arrival of Islam in India in eleventh century—their repeated destruction resulted in the oldest surviving Hindu temples on the ghats to date only from the eighteenth century. The temples are a significant part of the historic built fabric of the ghats. Their preservation program has to take into account that they are living sites of worship and as such they are renovated and repaired as needed and as per resources of the temple trusts responsible for their maintenance. A number of temples are built in the panchyatana style with the central shrine surrounded by four smaller shrines at four corners of a square. The shikhara tower surmounts each shrine—the one over the central shrine dominates over others. The shikhara tower curves toward the amalaka and kalasha finial and has half-shikharas in relief superimposed over it resulting in a clustered effect. Examples include Shiva Durga Temple on Manikarnika Ghat built in 1850 and Lakshminarayan Temple near Assi Ghat built in 1902. Domed or pyramidal vaulted roofs over the mandapa in front of the sanctuary with the shikhara tower are also common as in Vishvanath Temple built in 1777 and Tarakeshvara Temple on Manikarnika Ghat built in 1792. Other regional styles are represented as in the Samrajeshvara Temple on Lalita Ghat with carved wooden panels and sloping roofs sheathed in copper built in the Nepalese style in 1843. Myths are re-enacted and homage to gods and goddesses offered on a daily and episodic basis, invigorating memory and renewing values, in the process generating fluid space. The Ganga and its ghats become sites of spectacle and performance in a temporal rhythm derived from the rising and setting sun and the changing flow of the Ganga in the dry and monsoon seasons. Death and its rituals on cremation ghats offer a macabre spectacle to the voyeurs. The ghats are the iconic image of Varanasi and of Hindu India. They are highly imageable in that they can be viewed in their entirety from the Ganga. The distant and near views generate a strong mental image in the observer. The ghat panoramas have been popular since the eighteenth century and have influenced a ‘way of seeing’ the cultural landscape. Their strong image, evoked from a consistent design vocabulary used in the past, is threatened by incompatible building structures, visual clutter of signs and billboards, and dilapidation. Design regulations of building facades and materials are prescribed to preserve their aesthetic character. Although the ghats are richly imageable, they are not legible in that they are confusing and disorienting, especially to the first time visitor. Legibility is defined as the attribute of the landscape that allows for comprehension of its structure, i.e. easy recognition of its parts and their organization into a coherent pattern. 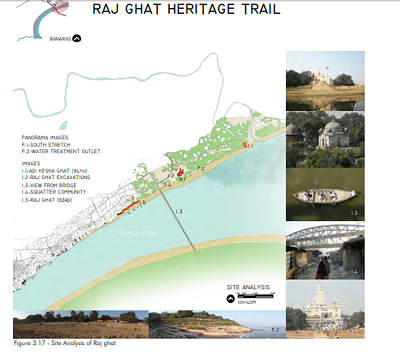 The ghats are envisaged as a legible and interpretive landscape by developing the following visitor facilities: way finding map to the ghats, heritage trails, informational and directional signage, ghat lighting, boat parking, and vending kiosks. Consolidating the dispersed vending and combining it with provision of essential goods will reduce the congestion and visual clutter of the ghats. The proposed heritage trails with directional and informational signage aid in way finding and understanding their spatial structure. Poorly lit areas lanes in the old city and stretches of ghats are illuminated to increase safety and encourage movement along the river. 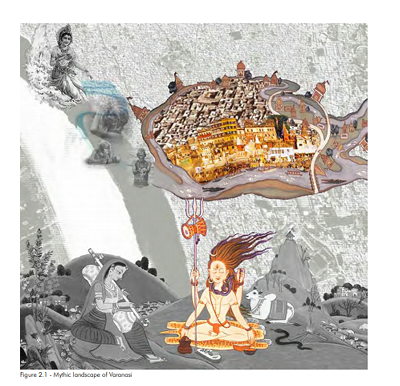 Visual aids such as maps, logos, and narrative walls depicting myths and legends, interpret the history and mythology of the ghats, reinforcing their role as sites of cultural memory. 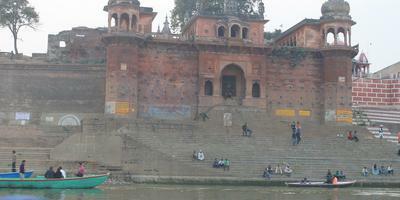 At Manikarnika Ghat, the proposed spatial organization and screening promise privacy and dignity to the bereaving. 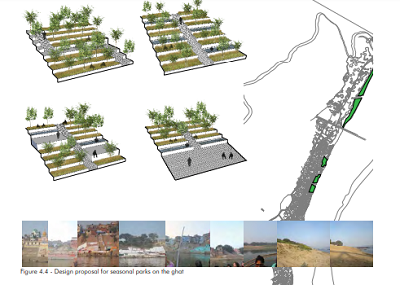 Amphibian space is created at the ghats’ edge through the proposed floating docks thus augmenting performative spaces. 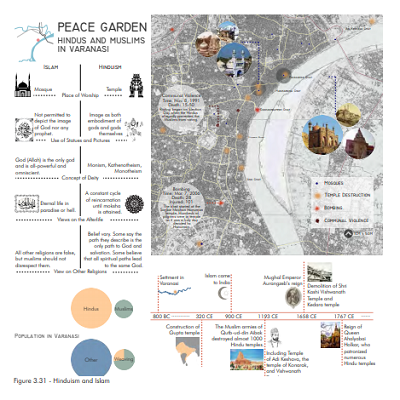 Peace gardens are designed to offer the possibility of diffusing communal tensions between Hindus and Muslims. Encountering Varanasi ghats is a sublime experience of the Ganga in all seasons and in many moods. The landscape is an assault on the senses and holds the possibility of a visionary experience. James Prinsep engravings of the Varanasi ghats in the 1830s depict a picturesque view of the landscape that romanticizes decay through passage of time. These images influenced subsequent representations of the ghat skyline that is inextricably linked to the identity of the city. The visual culture of ghats is rich with a variety of architectural forms and religious iconography. Color, textures, spires, fenestration, steps, platforms, vegetation, boats, among other elements, are repeated at irregular intervals and form the unifying element in a very complex visual structure. The iconic image of the ghats is threatened with visual clutter from encroachments and billboards resulting in loss of aesthetic value, most evident at Dashashwamedh Ghat. New buildings visually incompatible with historic structures cause visual dissonance as seen at Kedar Ghat. The historic fabric is deteriorating and endangered as evident at Raja Ghat and Chet Singh Ghat. Some of it is already extinct. These historic buildings are in varying degrees of disrepair, the ramification of which is a disappearing history. Making legible the past has the effect of exponentially enriching the visitor experience. This is an important rationale for preservation. 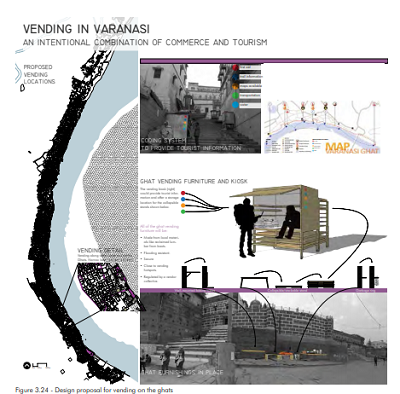 Varanasi ghats are in need of a comprehensive set of design guidelines for visual management. Historic buildings must be preserved in accordance with the historic design palette of temple spires, burjes, chattris, arched doorways and windows, and jharokhas. The height of new buildings must not exceed that of the tallest building—Alamgir Mosque on Panchganga Ghat. Rich vibrant colors are part of ghat identity. However an excess of color adds to the visual clutter. A color palette in harmony with the prevailing colors should be prescribed for painting the public buildings and ghat steps. Panoramic views of the ghats are obtained along the length of the Ganga Riverfront and the river itself is a magnificent view. It is difficult for visitors to see the entire stretch of the river from the ghats as they are stages for ritual activities and crowded with buildings. Sights from the Ganga are mapped with the boats as a moving viewshed and from specific locations at higher points above the ghats. Building structures on the ghats become viewing points for observers. Finding spaces to frame the view will enable visitors to appreciate the magnificence of this holy landscape. Boat travel is the best way for visitors to understand the entire ghat landscape. The east bank of the Ganga with panoramic views of the river and the ghats contrasts with the liveliness of the built up west bank. When experiencing the ghats on foot, the proximate senses are fully engaged but the interpretation of visual elements is hindered. The visitor on a boat on the Ganga, away from the hustle and bustle of the city, has the opportunity to see the panoramic skyline of the ghats. The skyline holds significant architectural value with its temple spires, fort like palaces with bastions, protruding balconies, platforms, and cubicles just above water. The layering of structures adds depth and serial repletion of forms provides the unifying thread in the architectural diversity of the ghats. 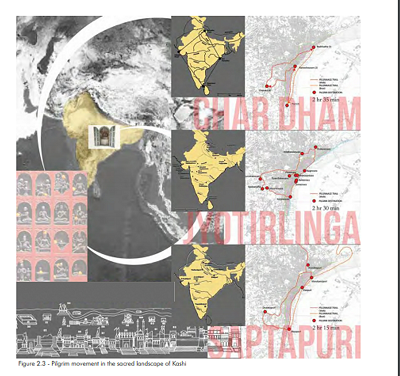 To identify repeating forms, walls, stairs, vegetation, platforms and prominent spires on each the 84 ghats were systematically represented in a graph format. 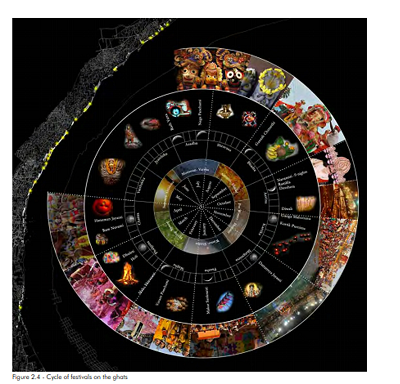 The frequency with which each of the elements occurs on the ghats is mapped. Although the elements are not spaced at regular intervals, their erratic repetition sets up a syncopated rhythm. 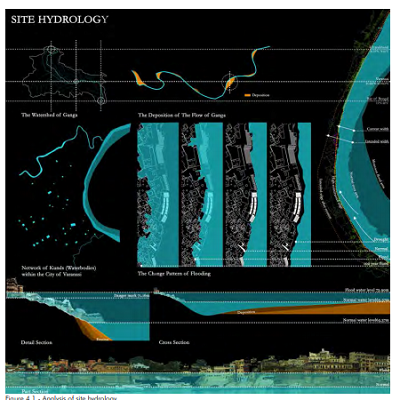 The ghat architecture responds to the changing water levels of the Ganga. The lower floors of palaces are opaque and built solid with octagonal or circular towers to resist the thrust of the rising waters. These are aligned with square, rectangular, octagonal, and circular platforms built over well foundations that divide the steps into bays and protect them from erosion. The platforms are occasionally hollowed out into cubicles that house shrines. Smaller structures are also built opening into the river--these are private spaces for bathing and meditation. The upper floors of mansions are porous with windows, balconies, and galleries for views of the riverfront. The steps set up an interesting rhythm especially as they cascade down from streets and buildings located at higher levels. 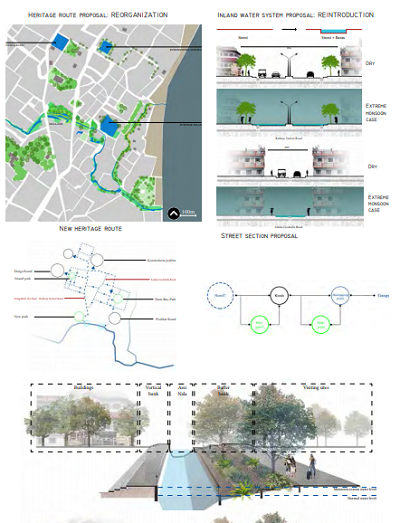 The riverfront becomes greener towards the north with unbuilt embankments and greater tree cover. Movement is studied at three levels: from urban transportation hubs to the ghats, from adjoining neighborhoods to the ghats, and between the ghats themselves. Streets follow topography—those perpendicular to the riverbank connect parallel streets to the ghats and drain storm water into the Ganga. The street network shows a dendritic pattern with the major thoroughfares broad and straight, while the pedestrian lanes of the old city are narrow and winding. They are crammed with people, animals and vehicles, dark and unlit. Views and space for movement open up in the ghats, but the ghats too become crowded on festive occasions and have their own circulation problems with the boats, as there are few docking points. Walking along the ghats takes about 4-5 hours. The five destination ghats for tourists and pilgrims include Assi, Dashashwamedh, Manikarnika, Panchganga, and Adi Keshav. It takes 10-15 minutes to drive from one to another, depending on traffic, or 20 minute by boat. At peak times in the evening, vehicular movement can be even slower than walking. The ghats are about 15- 40 minutes to the train station and airport, by cars and auto-rickshaws. There are bridges that cross the Ganga, but with narrow shoulders. 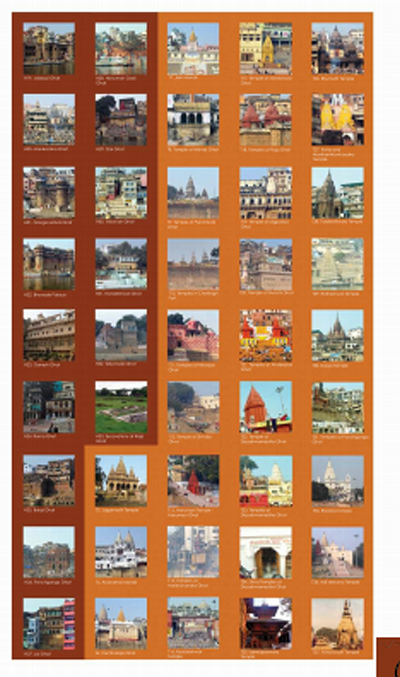 The way finding map of Varanasi Ghats is designed for aiding tourists when they are walking to and along the ghats. It shows the traffic routes from the airports and railway station to the ghats and its attractions. It also shows the street network, walking and boat trails, and significant sites. 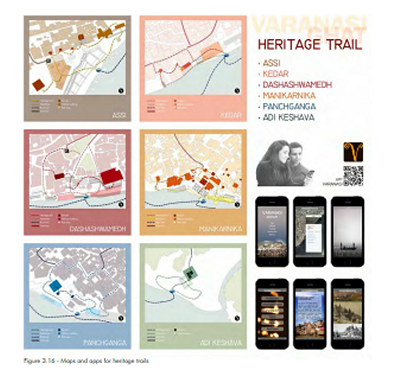 Heritage trails proposed on six ghats: Assi Ghat, Kedar Ghat, Dashashwamedh Ghat, Manikarnika Ghat, Panchganga Ghat, and Adi Keshava Ghat and the historic buildings and temples are marked on the detailed maps. Each ghat has its own small loop of heritage trail that connects its historic buildings and temples. Trail-heads are at entry streets from the city and boat docking points. The way finding map can be made available as an app for smart phone. Visitors can scan the QR code on the way finding map brochure and download the App. It has the map of Varanasi Ghats, local weather, facilities nearby, myths and legends associated with each ghat, as well as historic and sacred sites. The Rajghat Trail connects the 83rd and 84th, ghats on the Rajghat Plateau at the confluence of the Ganga and Varana. The sites are of immense archaeological and religious significance offering lessons in both history and myth. On Rajghat Plateau and further upstream along the Varana were the earliest settlements in the region dating back to 11th BCE. Excavations in 1940s and 1990s revealed the growth of rural hamlets at Akatha and Sarai Mohana into an urban center by fourth century BCE in the Mauryan period. The historic city flourished under different dynasties, its uninterrupted exitence coming to an abrupt end with Islamic invasion. The site has the remains of fort of the Hindu Gahadvala ruler, Jaichandra who was defeated by Qutb-ud-din Aibak in 1194-95 CE. The Gahadvala rulers worshipped at the Adikeshava Temple at the confluence of the Ganga and Varana using its ghat for bathing in the Ganga. Their fort was never rebuilt and the city moved southwards but the sacred significance of the site located on the Panchkroshi pilgrimage circuit did not diminish. Adikeshava Temple was rebuilt at the end of eighteenth century and other smaller shrines containing linga such as Sangameshvara (god of river confluence) commemorate the presence of gods. The archaeological and sacred sites representing history and myth respectively are juxtaposed in space but their lack of physical connection precludes their reading as an integrated narrative and a historic timeline by the visitor. Ferryboats for trade used this part of the riverbank until 1887 when the bridge across the Ganga was built. Today Raj Ghat is accessed from the city through a major street and has new shrines including one to the medieval saint Ravidas above stone steps built in the 1980s. On its north a major storm water outlet from the city empties into the river and a squatter community lives close by. To make the sites more accessible jetties are proposed at Raj Ghat and Adikeshava Ghat for visitors who choose to visit the sites in boats. A cultural heritage trail with interpretive signage is designed linking Adikeshava Temple with the proposed Archaeological Park around the ancient ruins of Varanasi. The areas along the trail open up to expansive views of the Ganga. The heavily eroded river embankment is redesigned as green terraced ghat to stabilize the soil and encourage vegetable and flower gardens. 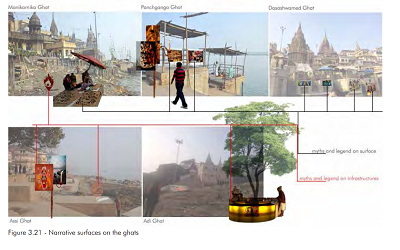 The proposed signage system will increase landscape legibility by identifying ghats clearly and aiding orientation. 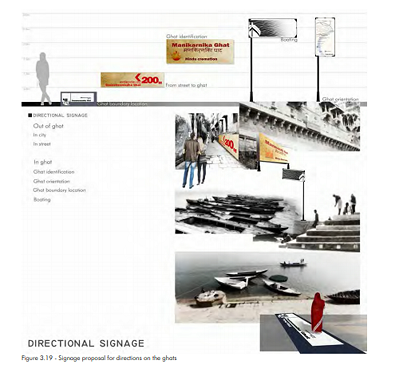 Two kinds of signs are proposed: informational and directional. Informational signage covers public service, caution and educational. Tourist center, emergency aid, drinking water, hotel, restaurant and restroom, among others will be displayed as public service signage. Examples of caution signage are no smoking and no littering. Educational signage covers historic buildings, temples, sacred sites, myths and legends and ritual ceremonies such as aarti. Directional signage will be placed on walls of the buildings and streets to show the way from the city to the ghats and the Ganga. In addition signage will illustrate the location of the ghat and its name as well as boating areas. According to one legend the five most sacred ghats represent different body parts of Lord Vishnu: Assi is the head; Dashashwamedha is the chest; Manikarnika is the navel; Panchganga is the thighs; and Adikesava is the feet. The five elements of all gross matter are sky, ether, fire, water and earth. Thus the five most sacred ghats can be identified in the following way: Assi as the sky, Dasashwamedha as ether, Manikarnika as fire, Panchganga as water, and Adikeshava as earth. The urban landscape of Varanasi is replete with vibrant folk art created by local artists. It can be found on building facades, street walls, water tower, steps, and on the boats. There are different types of art including paintings of gods and goddesses, murals, and sculptures. The themes, style, and color palette for narrative art depicting myths and legends that give identity to the ghats are modeled on urban folk art. 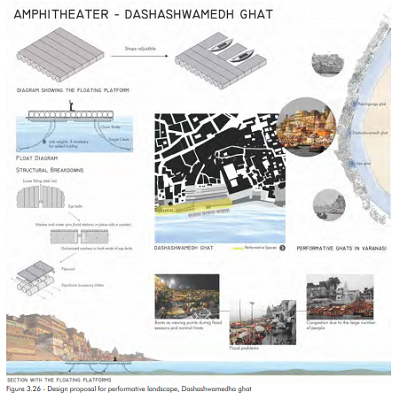 Rest platforms, lights, and planters are proposed as narrative surfaces for local arts on Assi Ghat, Dasashwamedh Ghat, Panchganga Ghat, Manikarnika Ghat and Adikeshav Ghat. Lighting of the ghats is uneven as there are hotspots that are brightly lit in an otherwise poorly lit riverfront. Certain ghats are lit during the evening aarti but travel between the major ghats at night time is difficult as there is no lighting. From overly bright ghats to mysterious dark corridors of the city, the lighting system in Varanasi is very sporadic. The new lighting system works to evenly spread light along the ghats, creating a safer space that is easily accesible. The lighting proposal includes bollard lighting for the trails between the ghats, hanging lights for the narrow lanes in the old city, step lighting so people can see their way down to the river, spot lighting for the heritage buildings as well as for signage, and evacuation lighting in emergency. 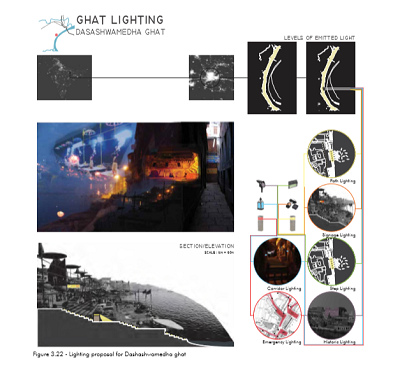 The levels of ghat illumination, existing and proposed, show where the light is most and least concentrated. The section cut shows signage, path, and step lighting. Vendors selling a myriad of items ranging from colorful silks to fruits to items used for worship, add to the chaotic atmosphere of the ghats both visually and physically. Though the vendor system may seem overwhelming and even disorienting at times to newcomers, it promises livelihood to many people. Stimulating to all of the senses, Varanasi's commercial landscape offers a compelling experience. Many commercial activities move, following the flow of pedestrian traffic. Merchandise overflows from corts and tables lining the streets. Standing shops entice with colorful displays of their goods, often hanging at eye level or above. Commercial activities create a dynamic landscape laden with color, texture, odor, and sounds, adding vitality to the scene. 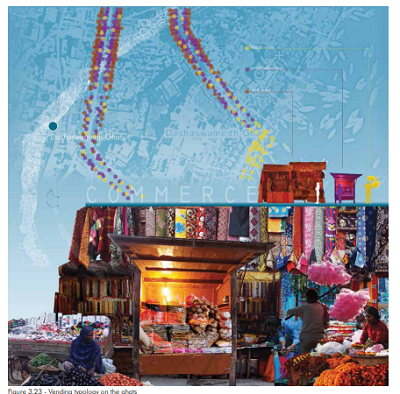 Although vending appears very haphazard initially, closer examination reveals a hierarchical arrangement of commerce along the street system and the ghats. This hierarchy is particularly apparent at Dashashwamedh Ghat, a popular tourist destination where many religious celebrations occur. Standing shops, often integrated into the lowest level of larger buildings, are set back the furthest from the flow of pedestrian traffic along the streets leading into the ghat. These merchants' locations are more or less fixed. Carts, items laid out on blankets to be pocked up at the days end, and make-shift tables, all semi fixed vendors, are a step closer to the passers-by. Mobile vendors carry their goods with them, moving easily with the changing tides of people. Congestion near the steps makes the narrow lanes leading to the river nearly impossible to successfully navigate and vendors calling their wares looked when they form makeshift markets made from tarps and posts. The more mobile vendors should be given a space to occupy and become an asset to tourists and pilgrims of Varanasi rather than a source of stress. Through small interventions along unused wall space on the ghats themselves, vendors are given a place to display goods near major channels of foot traffic instead of clogging the narrow lanes, Wall-mounted folding tables, garbage rings that hold plastic bags, and collapsible tables that can be stacked and stored at the day's end all give merchants an opportunity to better market their merchandise. Vendors can use these furnishings by signing up through a vendor collective, being assigned a table of their choice, and becoming responsible for the maintenance and security of the table. The furniture can be collapsed and locked on the ghats when vendors have finished their activities. Collapsible tables can be housed in a semi-mobile vending kiosk that offers tourist maps and assistance to visitors. A coding system can be outlined in the tourist map to show travelers where maps, first aid, true information or transportation assistance available. When tourists access this information via vendors they will perceive them as a resource for their navigation through the city rather than a source of harassment. Assi Ghat is one of the most popular ghats with easy access from the city. It received the patronage of Marathas in the 18th-19th c. The Jagannath Tem ple on the ghat is the replica of Jagannath Temple in Puri. Below of the footsteps is the linga of kundodareshvara Shiva under a Pipal Tree. In the after math of Assi Nala being diverted a kilometer to the south in 1980, the Ganga flow has receded from Assi Ghat, leaving a large exposed silt area. Located in the south end of the ghat stretch, it has relatively large open space with potential to be developed. However, the site is covered by large expanses of silt extending up to 120 feet from the steps. As a result, most activities occur on the unstable and uncomfortable silt-bed. Besides, the space between buildings and steps is not large enough for rituals. Seasonal flooding increases the water level resulting in lack of public space. The main activities include bathing in the holy Ganga River, worship of linga under the tree and in the temple, boat landing, praying and meditation, and the traditional aarti ceremony every evening. Strategies for creating amphibious space including: redesigning the ghals, inserting a floating stage for daily performance, and linear floating piers connecting the steps and water edge. The main objective is to enlarge the performance space and provide boat docking. The platform size around the temple and sacred tree is extended. Curvilinear shapes replace the original acute angle of the steps, thus preventing further silt deposit. A floating stage on the hard revements wall extends the stage area for the aarti performance. In the dry season the stage is supported by the wall, while during the monsoon season, it floats up with the water level. The floating dock consists of plywood 10 x 10' platforms supported by styrofoam buoyancy billets. For it to be stable for six people on board, the floatation capacity needs to be at minimum of 1300 lbs. For example the 10' x 10' platform would weigh 400 lbs (100 x 4 lbs per sq. ft) and 6 people at 150 lbs each equals 900 lbs. Therefore floatation required is 1300 lbs (900 + 400). With the use of only four (17" x 20' x 8) billets (425 lbs each equals 1700 lbs floatation), the platform can at minimum bear six or more people on board without capsizing. Also it can be combined and adjusted to create more spaces. As more platforms are added, boat parking will also increase. The linear floating bridges, supported by two extra revetments walls, connect the steps and water edge, on which people are able to walk on both dry and monsoon seasons. On the west side of bridges, there are several tall octagonal terraces for various activities during the dry season and connect the bridges to the platform when steps are under water in the monsoons. Dycel concrete revetments reinforce the embankment and prevent silt from accumulating on the ghats. The boats will park along the concrete revetment in the dry season and berth beside the floating bridges during the monsoon, thus adding space for the large crowds that gather to watch the aarti ceremony in the evenings. Manikarnika Ghat is the most popular site of cremation where the funeral pyres are never extinguished with about 28,000 bodies burnt every year. Cremation can be interpreted as the symbolic sacrifice essential for regenerating the cosmos-the ghat is therefore the site of recurring dissolution and recreation of the universe. It is associated with both Shiva and Vishnu, eternally present at the site that is absolute space and where time stands still. Here moksha, liberation from the cycle of rebirths is promised and the Ganga washes away the pollution of death. Circumambulation of Varanasi, the Panchkroshi Yatra, begins with a bath at Manikarnika Ghat. The ghat is mentioned in a 5th c. Gupta inscription, rebuilt in 1302 CE and renovated by the Marathas in 1735 CE and 1872 CE. The Holkar queen Ahilyabai in 1795 CE built Tarakeshvara Temple where Shiva is worshipped as Tarakeshvar, one who whispers the Taraka Mantra in the ear of the dying. 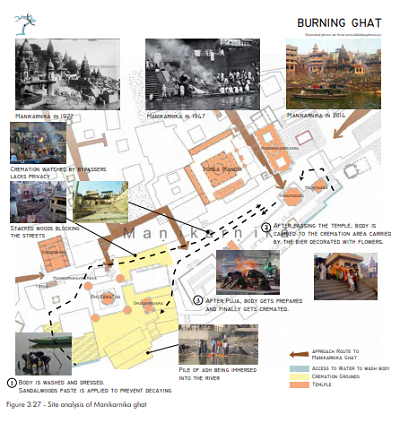 Early photo graphs of the ghats in 1922 and 1947 show cremation occurring on tiers of the embankments. Today the process of cremation is haphazard and spilling on to the floodplain. Stocks of wood in the narrow lanes interfere with the mourning processions, and crowds of voyuristic tourists in boats gape at the spectacle of death. The redesign of Manikarnika Ghat organizes space by introducing 21 new cremation platforms in front of Bhuthnath Temple with circulation spaces for mourners. A separate loading zone for wood transported by boats is demarcated and movable screens for privacy are proposed. This ghat marks the confluence of five rivers-Ganga, Yamuna, Saraswati, Kirana, and Dhupapa and has been popular among the faithful since the 11th12th Gahadvala period. The great Bindu Madhav Temple, described by Tavernier in 1665 CE, was an awe-inspiring structure, built by Man Singh, ruler of Amber in 1585 CE. It was demolished by the Mughal Emperor Aurangzeb in 1673 CE and the imposing Alamgir Mosque built at the site. The Vishnu deity was housed in small house nearby that came to be known as Bindu Madhav Temple. The Maratha Peshwas repaired the ghat in 1735 CE, first constructed in 1580 CE. Panchganga Ghat is associated with the Ramananda, the teacher of Vedanta, Kabir, the bhakti poet and the great author Tulsidas wrote his book Vinaya Patrika on this ghat. In October November every year during the Hindu Karttik month, devotees bathe in the Ganga here in large numbers, as this is an auspicious time. The ghat is lit up with tall bamboo poles with lamps to commemorate ancestors. The viewsheds to and from the Ganga are striking with domes of the mosque and steep flight of stairs adding to the picturesque effect. 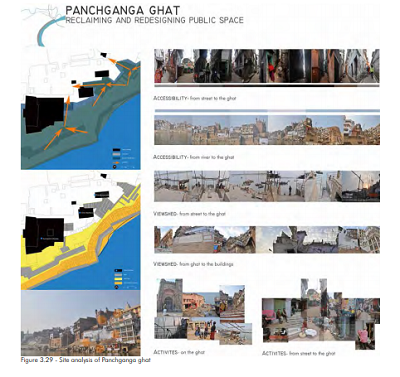 The Panchganga Ghat is difficult to access from the city as the streets leading to it are narrow and labyrinthine plus there are encroachments on public space and signs are lacking. 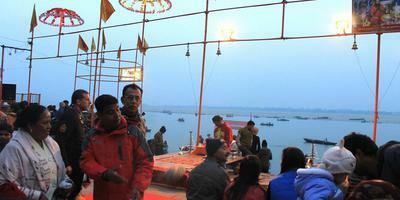 Public space on the ghat too is inadequate especially in the evenings when the aarti to the Ganga is performed. In the redesign proposal performative space is added by linking the platforms extend. ing into the Ganga. The plaza at the higher level between the mosque and the temple overlooking the ghats is redesigned as a peace plaza to bring the Hindu and Muslim communities together. Signage and lighting enhance the legible quality of the public space. Between the eleventh and seventeenth centuries the temples of Varanasi were destroyed at least four times but the remarkable resiliency of the sacred sites is attested in rebuilding of temples. The history of repeated destruction of temples and building of mosques at the sacred sites of Hinduism can be read in the cultural landscape of Varanasi even today. Although it may be difficult to overlook reminders of the past, this history should be put into perspective and read as chronicle of not just conquest and destruction but also harbinger of the hybrid Indo-Islamic culture in music, arts, cuisine, and myriad economic transactions. In spite of occasional conflicts, residents of Varanasi with different religious backgrounds share an easygoing life style, marked by bonhomie. Although a minority forming about a quarter of the population, Muslims plays an important role in the urban economy. Weaving is one of the largest industries in Varanasi, and about 70% of weavers are Muslims. At Balaji Ghat, the historic palace with the Balaji Temple built by the Peshwas in 1735 CE is now being renovated for public use. It is adjacent to the Alamgir Mosque built on a site dedicated to Bindu Madhav Temple first built in the eleventh century and then again in the sixteenth century, finally demolished a century later. This juxtaposition of Hindu and Muslim religious sites is as an ever present reminder of the diversity and pluralism of Varanasi. Balaji Palace has an open terrace offering a panoramic view of Ganga where a public plaza/garden is proposed. The peace garden uses traditional Indian weaving patterns, heritage common to all living in Varanasi. The garden design does not use religious symbols --it is simply a community space that brings people together for interfaith dialogue and shared meals on Hindu and Muslim festivals. 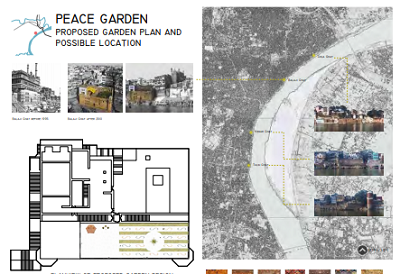 The prototypical peace garden can be inserted at several sites along the riverbank where communal violence has occurred in the past such as Gola Ghat, Kedar Ghat, and Assi Ghat. The physiography of the Ganga's banks is mapped in site hydrology-Ganga and Varuna flow in summer and monsoon, flood and drought conditions, in land water bodies; terrain of ridge, hills, floodplain; and soils and vegetation. Ganga, the archetypal river of purity washing away physical dirt and moral sins, is now polluted because of the large amount of waste generated at the ghats and by the city. Ritual worship and bathing, cremation, and sewage cause the Ganga water to be contaminated and a health hazard. The ghats in Varanasi are envisaged as a healthy landscape by reducing point source pollution in the Ganga and creating a clean land water interface through public sanitation programs and design prototypes such as non-polluting bathing fonks, compost gardens, biofiltration basins, and ghat recycling center. Natural cleansing systems, such as wetlands and phytoremediation treat wastewater and increase biodiversity. Local composting and recycling are proposed to reduce the biodegradable waste. Bathing tanks are designed with bio-filtration basins for de creasing contaminants in the water, thus promoting the health of the river and of those who engage with it. Dumping sites near the ghats are reclaimed as waste management facility in a landscape of marshy lagoons for phyforemediation. The urban sanitation and composting programs should aim to limit river BOD (biological oxygen demand) to a safe level by 2030. Education through the use of on-site murals and other media to promote proper waste disposal and recycling will positively engage the community in ensuring a clean environment. The Ganga is flooding more often because of de forestation upstream and constriction in its flow locally caused by silt deposition on the east bank. Frequent flooding negatively impacts the ghats and the city above them. Their resiliency, i.e. their ability to recover rapidly from disaster and prepare for as well as prevent future catastrophes from recurring, is increased through site planning and design. 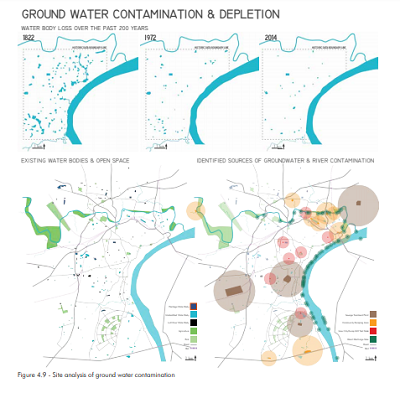 By reclaiming inland water bodies, and restoring Varuna River and Assi Nola watersheds as greenways, resiliency of the urban landscape to cope with flood events is improved. In this ecological approach, on the northern stretch of ghats, planted edges and constructed wetlands are recommended. The width of the river is increased by silt removal thus allowing the rising waters to spread on the east bank. This shifting fluvial landscape is reclaimed as public space that can be used intensively in the dry season for recreational activities thus alleviating the stress on the ghats. Building wetlands that act as biofiltration basins and planting memorial groves that recycle cremation ashes as fertilizer in sediment fills in upland areas stabilizes the landscape. The Ganga meanders through the Indo-Gangetic plains of Northern India leaving traces of erosion and deposition of sediment transported by the River. The holy city of Varanasi and its majestic ghats on the western bank sit on the erosion edge while the east bank is the deposition edge. On the highly constructed west bank there is visibly less erosion. The water level of Ganga fluctuates through the year affecting the ghats; however the normal water level is 65.37 meters, allowing the various rituals and other activities to occur. In drought the water level is around 60 meters above the mean sea level that results in exposing the silt bed. Due to climate change the frequency of flooding is increasing, occurring now at every five years interval. The highest level of flood recorded as 73.90 meters is well above the 71.26 meters considered to be the danger level completely submerging the ghats. The 100 year flood will cover all parts of the ghats, including temples and historic buildings. 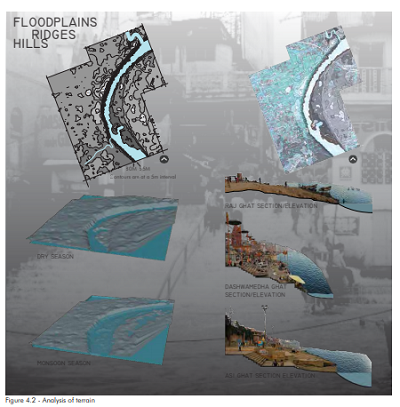 The flooding and silting is a threat to the cultural landscape and design intervention should take into account the flooding cycle as well as the process of erosion and deposition. The mild slope of the east bank is continuously covered with layers of silt deposition every year. With deforestation in the Himalayan foothills, sediment loads in the Ganga are increasing. The sand bed formed in the flood plain expands laterally and increases in height with the downstream flow, the maximum elevation being Prahlad Ghat. In the absence of sand mining on the east bank the width of the river is constantly decreasing. 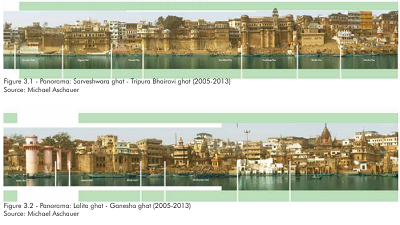 Due to this decrease there is constant pressure on the built edge that may result in collapse of the Ghats in future. Mapping the terrain of Varanasi at 15 meter intervals revealed the high ridge on the west bank marked by three hills associated with the trident of Shiva. The promontories are the nuclei of three sacred regions of Varanasi-Omkareshwara Khanda in the north close to the confluence of River Varuna with Ganga, Kedareshvara Khanda in the south close to Assi Nala, and Vishveshvara Khanda in the center. The high elevation of the west bank has made it suitable for urban settlement. Soils and vegetation mapping of east and west banks of the Ganga points to several problematic issues. The soil is mostly sandy or a sandy loom and not an ideal medium for vegetation growth. Furthermore, it is not appropriate for building, as it does not have much support. The west bank of the Ganga is densely built up with the ghats and has only a sparse number of trees struggling for survival. In the northern section of the ghats, there is denser vegetation due to the Varana River and for fewer building structures. Many trees found in this section such as banyan and peepal trees have sacred associations. The farmland across the river is located on higher ground. Seasonal farming is done on the northern part of the west bank and towards the southern part of the east bank where the flood plain soils can support vegeta-bles and fruits. Stretches of the west bank with a hard slope between the ghats are currently unused or just being used for drying. The land in these areas can be terraced opening up new possibilities. Pocket parks with small areas for vegetable gardening and clean bathing tanks are proposed. Furthermore, drying areas for washer men can still be provided. This will help create a more sustainable community space and add more greenery along the ghats. It could potentially lessen congestion from the more dense areas as well. Additionally, green terracing will help with erosion problems on the unbuilt slopes caused by flooding. In the vegetable semihard-scape local sandstone will be used to construct the terraces and native trees and grasses will be planted. The ghats are littered with rubbish and it is not uncommon to stumble into rotting piles of offerings. Some of this waste finds its way into the Ganga, littering the shoreline and bobbing along with the current. Occasionally the horrifying sight of a floating half-cremated body can be seen. This calls into question the purifying powers of the holy river. Although industrial waste from the upper Ganga basin in Uttar Pradesh can account for some of the con lamination of the Ganga, Varanasi city contributes to 350 million liters of sewage each day. Sewage and domestic waste drains into the river with only about one third of it processed by sanitary treatment facilities. The biochemical oxygen demand in the Ganga, a measure of contamination, increases by more than 500 percent after passing through Varanasi. Sewage treatment plants are operating over-capacity and waste management programs are not effective. Point source pollution from the street sewers pours into the river at locations shown on the map while non-point source pollution from industry and agriculture adds to the overall contamination levels. Ritual offerings and the plastic bags they are carried in, washing of clothes and bodies, animal waste, 7000 tones of ash released from about 88 cremations every day and 300 tones of charred human flesh have made the Ganga unhealthy. Biodegradable and non-biodegradable waste products generated on the ghats should be properly disposed of in an effort to reduce the amount of waste entering the river. Without urgent measures to mitigate pollution this cultural, natural, and spiritual resource will threaten the safety of those who interact with it. Implementing a compost program in Varanasi offers a productive use for biodegradable waste currently point source pollution for the Ganga. Ritual offerings, animal waste, food scraps and other compostable materials rot on the steps when they could be transformed into a productive growing medium. In the proposed system compost production would happen at two scales: at a smaller scale on the ghats themselves and as part of a larger solid waste management system. Site furnishings for composting include waste receptacles that sort garbage, recyclables, and compost materials, a well as compost bins, compost tumblers, and solid waste transport boats that collect the sorted waste and take it to the solid waste management center on the north and east banks. The waste management center would handle garbage incineration, recycling, and compost production for nearby fields. 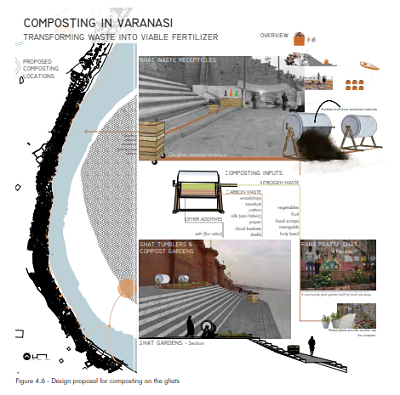 The site-specific composting would utilize landings as miniature community gardens, and place tumblers, waste receptacles, and rolling bins at strategic points along the ghat stretch. 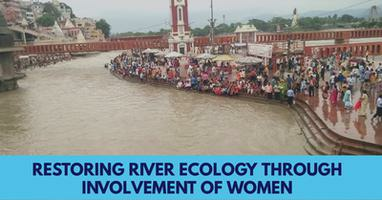 A precedent for community members reclaiming ghat space for plant production exists already on the Rana Pratap Ghat. The compost gardens would be similarly socially engaged involving local community members. Compost site furnishings must be made from local materials. The tumbler barrels can be reclaimed from nearby industrial plants. Wooden frames to house trash bags, bins, and the tumblers themselves can be made from recycled lumber from old boats. The low, stacked-brick growing beds like those on the Rana Pratap Ghat garden can withstand flooding if properly constructed and filled in with new soil at the beginning of each new season. Tumblers, bins, frames and trash bags, on the other hand, are all sufficiently mobile to be moved during the monsoon. With the proper utilization of local materials, education, and community engagement, composting can be a com. munity resource and a long term sustainable solution for waste management. Bathers in the Ganga are exposed to contaminants through direct contact with water that has untreated effluent and waste. Pollutants are released into the Ganga when pilgrims bathe due to the use of soaps, or other detergents that contaminate the water. The prototype of the private bathing tank with filtration systems is designed to solve the water contamination problem. Biofiltration systems under the two octagonal platforms improve the water quality by pumping and releasing clean water from and to the Ganga. This ensures that the Ganga is not further contaminated, but most importantly, to keep the bathing tank clean for pilgrims. The private bathing tank is most needed in Dashashwamedh Ghat as well as in many other ghats that are bathing hotspots along the sacred Ganga. The form is derived from existing design typologies of bathing structures on the ghats. 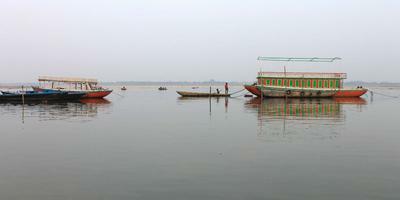 The private bathing tank fulfills the crucial need of having a clean bathing environment in the Ganga. There is an acute shortage of water in Varanasi because the water supply system is over a century old and the distribution system is inadequate About 55% of water supply needs are met by tube wells and hand pumps leading to ground water depletion. The adequate solid waste management and absence of sanitary water treatment plagues the ghats landscape and increase pollution in the Ganga. The city's high resident and floating population strains current municipal facilities for beyond their functioning capacities, which leads to large amounts of untreated waste water being expelled directly into Varana and Ganga Rivers and the failure to collect approximately eighty six metric tons of waste in the city every day. The combination of intermittent power loss, fluctuation in the Ganga velocities, rising and falling levels as well as outdated, poorly managed treatment facilities has resulted in deterioration of public spaces and increasing groundwater pollution. The region once had an extensive system of natural and manmade water bodies called talabs and kunds respectively. In ancient times, these water bodies were constructed and used strategically to collect and store water for times of drought while unintentionally providing a natural groundwater recharge and filtration system for the city. As Varanasi expanded, these water bodies were encroached upon, depleted for drinking and irrigation water as well as filled in for urban development. The present situation of amassing uncollected garbage has forced the community into establishing large-scale community dumping grounds on the outskirts of the city, as well as filling the low lying areas and ponds, i.e. what remains of the ancient water body network within the city with rubbish Studies on groundwater quality in Varanasi show that the most vulnerable points for groundwater contamination were in public areas filled with waste. 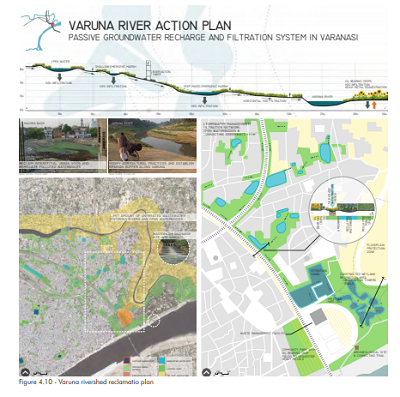 The main objectives for the Varuna Action plan are: 1. Reclaim interstitial urban voids and remediate existing polluted water bodies into a green and blue network to generate a rediscovered public domain. 2. Limit the amount of untreated wastewater directly entering the rivers and open water bodies. 3. Modify Current agricultural practices along the Varuna River to establish a riparian buffer corridor and utilize oil-bearing crops to sequester heavy metals in the soil and avoid public consumption of crops laden with toxins. The site design includes a connected system of passive storm water management strategies: subterranean infiltration trenches, greenways, and a waste water treatment recreation area comprised of retention ponds for settling and a constructed wetland organized specifically for treatment of water contaminated with heavy metals and sewage. The large former community dumping area will serve as a potential space for a waste management facility as well as a site of extensive phyloremediation. This recreation area will connect the currently underappreciated archaeological site with the proposed cultural heritage trail and the main transportation hubs of the city. In ancient times, inland water bodies dotted the watershed of Assi Nala, and they drained and stored water. During monsoons the overflow from the talabs drained into the Gange. 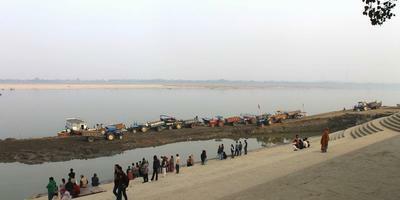 As the water level of the Ganga increased the overflow and the river mixed. A few years ago, Assi Nala was diverted southwards, so part of original Assi Nala lost its capacity to drain water to the Ganga. The new Assi drain has more strong drainage capacity, and the flow of the waters faster; however the inland water system is destroyed, and the city floods frequently in the monsoon sea son. 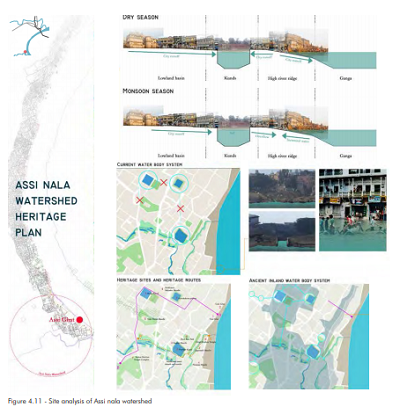 Currently the watershed of Assi Nala is heavily encroached, and the urban hydrology is disturbed. In order to deal with city floods, it is proposed to reintroduce the original hydrology by changing the street section and increasing the street capacity to hold overflow during the monsoon season. The important historical and sacred sites in the area can be linked by the proposed heritage trail along this part of Nala. The east bank is a flood plain flooded with water as the Ganga swells in monsoon leaving layers of silt and sand deposition along the convex shore line. 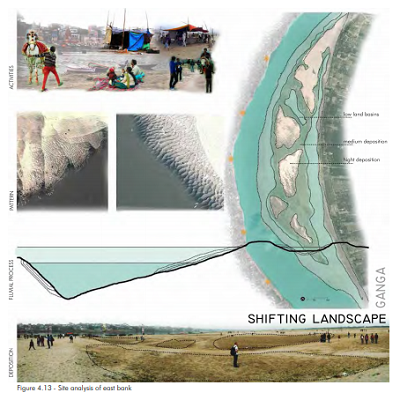 The higher sand mounds and lower alluvium is a shifting landscape changing with the season and with the Ganga's flow. There is seasonal farming of watermelon and bitter gourd. The flood plain offers panoramic views of the ghats and is used for recreational activities such as pony rides and picnics. Aghoris have set up camps and have made sand lingas for worship. The east bank is redesigned with the fluvial process of successive deposition. The low-lying areas are proposed as retention ponds planted with grasses for bio-filtration to occur. The intermediate level with rich alluvial deposits is designated for seasonal farming. The highest level is planned for public use with the maidan (large public space for multifunctional use) in axis with Dashashwamedh Ghat on the west bank. During monsoon flooding the high points are still usable. Sand dredged from the shoreline can be used to fill the low-lying area below the farmland where a memorial grove is proposed. Sand dredging will increase the width of the Ganga flow by 300 meters and less en the pressure on the west bank. Walking trails are proposed on ridges formed by accelerated natural process where the sand on the site is mixed with the bacteria Bacillus pasteurii forming into sandstone. 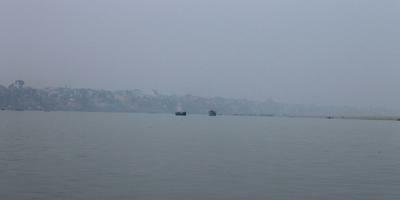 Approximately 300-400 bodies are cremated every day on the banks of the Ganga. The ashes of a cremated body weigh roughly between 1.8 and 2.7 kilograms, or 4-6 pounds. Each day, as these bodies are cremated at ghats such as Manikarnika, a startling amount of ashes accumulates between 544 and 1088 kilograms, or 1200-2400 pounds) at these sites, and much of it is dumped in the Ganga. Though intended as a positive spiritual act to ensure the soul's passage into heaven, these ashes are contributing to the Ganga's unbelievable levels of pollution. 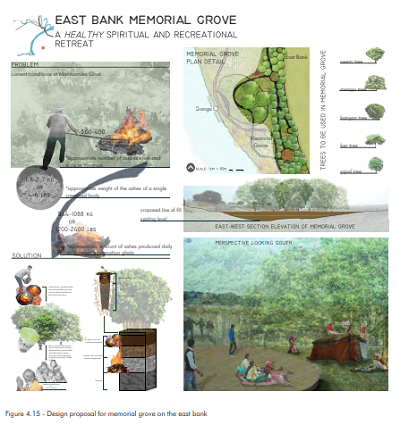 To reduce the pollution the concept of the East Bank Memorial Grove where ashes would be preserved was developed. The soil construction of the Memorial Grove applies the Biourn system at a much larger scale. Biourns are composed of two layers of soil one upper organic layer housing tree seeds and a second layer that incorporates cremated ashes of loved ones. These layers are encased in a biodegradable "urn" that is planted in the ground. As the seeds germinate in the first layer of soil, the growing roots penetrate the ash layer and use the ash as fertilizer. The idea of the Memorial Grove system is to use composted materials in topsoil to create a suitable environment for seeds to germinate, and then penetrate the deeper ash layer of soil as the roots grow. Because the Grove lies in a low-lying area of the East Bank, sediment fill from the shoreline into this area is proposed along with the planting of several banyan trees in order to stabilize the area and help it withstand flooding. The Memorial Grove design incorporates a series of elevated platforms and walkways created from recycled wood. These large platforms allow for various activities including prayer, rituals, picnicking, and other recreational activities. These platforms act as openings in the grove, and are in the vicinity of one large memorial tree and a few smaller trees, or a small grouping of three memorial trees. The East Bank Memorial Grove is a site for remembrance, spirituality, recreation, and education. The Ganga Action Plan has not been completely successful so far in part because it is guided by a top-down planning approach. In this engineering approach, cultural practices, folk beliefs, and local community traditions are ignored. 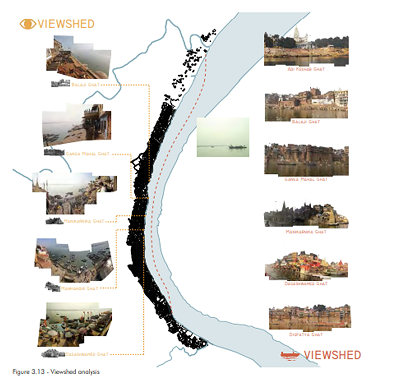 The multiplicity of stakeholders, widespread encroachment of public land, and ineffective and inadequate local ordinances are some of the challenges in conserving the Varanasi ghats. Site planning and management should take into account what is today considered non-essential knowledge—the esoteric language of myths, hidden meanings of rituals, and sanctity attributed to nature evident in everyday practices so that a new culture specific, participatory model for solving complex problems can emerge. This bottoms-up eco-cultural approach advocates the use of appropriate technology, local materials, and renewable energy sources. Programs such as vending collaborative and on-site composting will engage the local communities and improve the local economy. 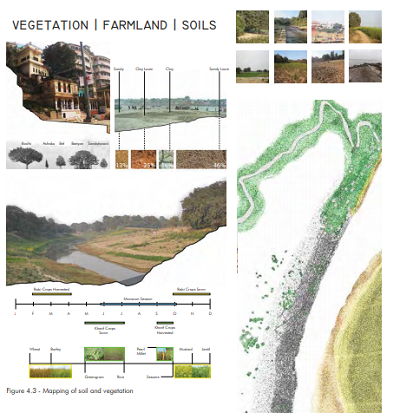 Greening of the west bank embankment and seasonal farming on the east bank of Ganga and Varuna banks are ecologically sensitive land uses. Recycling cremation ashes in the memorial grove is an invented cultural tradition for environmental remediation, in keeping with the ethos of sacred landscape. 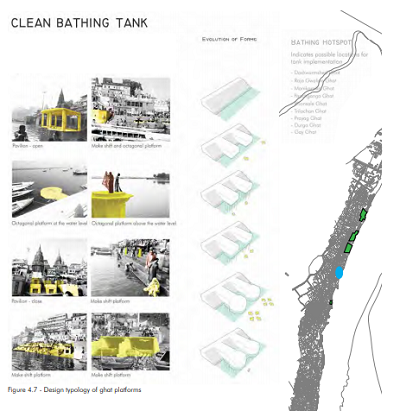 Amphibian space created in floating platforms responsive to fluctuating water levels and bio-filtration bathing tanks promote cultural traditions gradually being abandoned. Public spaces reclaimed as peace plazas and reclaiming surfaces as narrative spaces have the potential for healing communal strife and reviving urban art folk practices. Heritage conservation can thus become an empowering tool for local communities and for the visitor an opportunity for spiritual growth.